Although WYA welcomes the inclusion of topics such as maternal health, continuing education for young parents, and the family, we regret the inclusion of problematic and controversial terms that promote abortion and comprehensive sexuality education. WYA thanks those Member States who worked hard to change these provisions; without their efforts the results would have been much more troubling. In the end, the most controversial language could not be agreed upon, and so was replaced with language from last year’s agreed conclusions. The adoption of the agreed conclusions itself was not without both confusion and controversy. Two Member States, Saudia Arabia and Bahrain, both of whom are members of the Commission, stated that they would not join consensus before the document was presented. In their statements, they raised concerns about language related to abortion and sexuality education, concerns about unclear and ambiguous terminology, lack of respect for national sovereignty, lack of sufficient emphasis on the family or respect for parental rights, and poor management of negotiations. They both stated that issues which violated their “redlines” were given insufficient time and rushed through at the end. The representative of Bahrain also stated that he had been bullied both by high UN officials and CSW officials, including threats to contact his government and ask to have him recalled if he failed to cooperate with their policy goals. Following these statements, the Chair, Ambassador Geraldine Byrne Nason of Ireland, tabled the document for adoption by consensus and it was adopted without objection. The delegates from Saudi Arabia and Bahrain raised points of order and requested clarification from both the chair and the UN secretariat staff. Both replied that the document had been offered for consensus and no objections raised, or vote requested, at that time. Although this may be procedurally correct, in similar circumstances, such as the Commission on Population and Development, chairs have recognized that consensus does not exist, and withdrawn the text from consideration. Using a procedural maneuver in such cases suggests that the end result was more important than whether the document reflected true consensus. Other Member States, although they did not formally object to the document, made reservations on the most controversial language in the text, withholding their agreement from those parts. 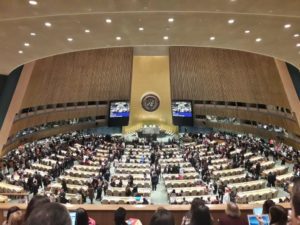 Member States including Brazil, Guatemala, Nigeria, United States, Sudan, and the Holy See made reservations about “sexual and reproductive health and rights,” a term which is widely understood to promote abortion. Several countries also said that their understanding of the agreement would be interpreted in light of their national laws and cultural and religious values. Even so, other countries expressed their belief that the already tenuous “agreement” had not gone far enough on those issues. This year’s negotiations were particularly fraught. More than half the document was not agreed two days before the end CSW, and frustration with the slow progress spilled over into topics that are generally not controversial. Some Member States also expressed dissatisfaction with the inclusion of topics they considered unrelated to the theme, and several stated that they wished the challenging paragraphs had not been left until so late. During the final week, negotiations went late into the night, a disadvantage for countries with smaller delegations, as Liechtenstein’s representative pointed out—an ironic element given that work-family balance and decent working conditions were discussed at length. Another issue that concerned many Member States was bullying. The facilitator, Deputy Permanent Representative of Kenya Ms. Koki Muli Grignon, broke down in tears presenting the document when she described receiving over 1,000 text messages to her personal phone during negotiations, and said that she was the subject of a petition, calling on her to oppose abortion language during negotiations. World Youth Alliance condemns all harassment, bullying, and threats. We regret that Ms. Grignon was subjected to such treatment, which WYA did not participate in, and call upon all members of civil society to reject. WYA likewise is seriously concerned about the harassment experienced by delegates, particularly the allegation that it was carried out by high ranking members of the Commission and UN staff, and which appears to have been ideologically motivated. WYA calls upon the Commission on the Status of Women, UN-Women and other relevant UN staff and agencies to respect the equality of all Member States, to ensure an open and transparent negotiations process, and to restrict their interventions to technical guidance and expertise. Want to learn more about policy? Check out WYA’s White Papers.